A lot of people say they are deeply puzzled by the slow recovery in the U.S. economy. They look at the 9+% unemployment rate and the mediocre growth in national output, and they scratch their heads and wonder: Where is the boom that inevitably follows a deep bust, such as we experienced in 2008 and 2009? But there is no mystery. What other result would you expect from the financial ruin of the once-great American middle class? And make no mistake, the middle class has been ruined: Its wealth has been decimated, its income isn’t even keeping pace with inflation, and its faith in the American economy has been shattered. Once, the middle class grew richer each year, grew more comfortable, enjoyed a higher living standard. It was real progress in material terms. But that progress has been halted and even reversed. 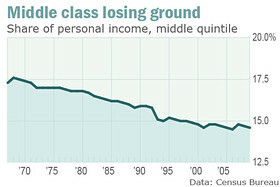 In some respects, the middle class has made no progress in a generation, or two. This isn’t just a sad story about a few losers. The prosperity of the middle class has been the chief engine of growth in the economy for a century or more. But now our mass market is no longer growing. How could it? The middle class doesn’t have any money. There are a hundred different ways of looking at the economy, and a million different statistics. But if you wanted to focus on just one number that explains why the economy can’t really recover, this is the one: $7.38 trillion. That’s the amount of wealth that’s been lost from the bursting of housing bubble, according to the Federal Reserve’s comprehensive Flow of Funds report. It’s how much homeowners lost when housing prices plunged 30% nationwide. The loss for these homeowners was much greater than 30%, however, because they were heavily leveraged. Leverage is an amazing thing: When prices go up, the borrower gets all the gains. And when prices go down, the borrower takes all the losses. Some families lost everything when the bubble collapsed, others lost very little. But, on average, American homeowners lost 55% of the wealth in their home. Most middle-class families didn’t have much wealth to begin with — about $100,000. For the 22 million families right in the middle of the income distribution (those making between $39,000 and $62,000 before taxes), about 90% of their assets was in the house. Now half of their wealth is gone and it will never come back as long as they live. Of course, rich folk lost lots of wealth during the panic as well. Their wealth is mostly in paper not bricks — stocks, bonds, mutual funds, life insurance. The market value of those assets fell further than home prices did during the crash, but they’ve mostly recovered their value now. The S&P 500 (^GSPC – News) lost 56% of its value when it crashed, but it’s doubled since then. Stocks are down about 13% from peak. The rich recovered; the rest of us didn’t. If losing half your meager life savings weren’t bad enough, the middle class has also been falling behind in terms of income for decades. Families in the middle make most of their money the old-fashioned way: Working their fingers to the bone for 40 years for wages and a modest pension. Their wages have been flat after adjusting for inflation. In the late 1960s, the 20% of families right in the middle were earning almost their full share of the pie: they had 17.5% of total income. Their share has been falling steadily ever since. Now, that 20% is earning just 14.6% of all income. Meanwhile, the top 5% captured a growing share, going from 17% in the late 1960s to 22% today. The housing bubble was the last chance most middle-class families saw for grasping the brass ring. Working hard didn’t pay off. Investing in the stock market was a sucker’s bet. But the housing bubble allowed middle-class families to dream again and more importantly to keep spending as if they were getting a big fat raise every year. I don’t think we’ve quite grasped how much the bubble distorted the economy in the Oughts, and how much it continues to distort it today. We’re still paying the bills from that binge. 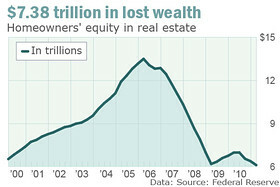 During the last expansion from 2003 to 2007, according to an analysis by Fed economists, American homeowners took $2.3 trillion in equity out of their homes through cash-out refinancing and home-equity loans, and they spent about $1.3 trillion of it on cars, boats, vacations, flat-screen televisions and shoes for the kids. All that spending circulated through the economy, creating millions of jobs here and in China, where they make those TVs and shoes. During that period, the economy grew at an annual average rate of 2.7%, which is about typical for our economy. But growth would have been closer to 2% if we hadn’t had a housing bubble; if we hadn’t had the extra consumption financed by the bubble and if we hadn’t built millions of surplus homes. That’s a huge difference. At 2.7%, the economy can create a significant number of jobs. But 2% is stagnation, not even keeping pace with population growth and productivity improvements. 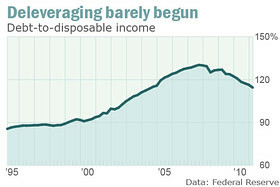 Now that the bubble has burst, homeowners are putting money INTO their homes, not taking it out. The impulse to pay down the mortgage and the credit card is reducing the amount of money we’re spending on other things. Since 2007, instead of taking $2 trillion out of their house, homeowners have put $1.3 trillion into them. You think that might be having an impact on consumer spending? Even with trillions in debt being paid off or written off, very little progress has been made in deleveraging. The debt-to-disposable income ratio has slipped from 130% at the height of the bubble to 115%, but that’s still far more than the 90% recorded in 2000 or the 80% of 1989 or the 60% of 1976. No one knows how far it needs to fall before American families are comfortable with how much they owe. The slow growth in the economy is no mystery: Most families don’t have any extra money to spend. It will take a long time for the middle class to rebuild its wealth, especially if we don’t find some work. The crazy thing is that our leaders aren’t even talking about this crisis. With the upper classes prospering and global markets booming, they don’t need the U.S. middle class any more. The market is up, profits are soaring, and the corporate jet is fueled and ready for takeoff. And if the middle class can’t buy bread? Let them eat cake. Rex Nutting is a columnist and MarketWatch’s international commentary editor, based in Washington.